Child Care Today gives students a solid introduction to the theory and practice of caring for young children and prepares students for professional certification in early childhood care and education. 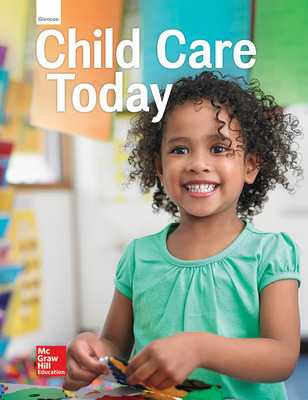 Explores child care career options, explains theories in early childhood development, offers tips and options for developmentally-appropriate child care activities, and exposes students to the practical business aspects of working in a child care setting. Students practice developing educational programs and activities and learn about health and safety concerns. Child Care Today is aligned to national academic standards in English Language Arts, Mathematics, Science, and Social Studies. Content updates include new images throughout, alignment to the updated Child Development Associate certification process, updates to MyPlate, food groups, serving amounts, with additional content about bullying and online safety, security, and privacy. 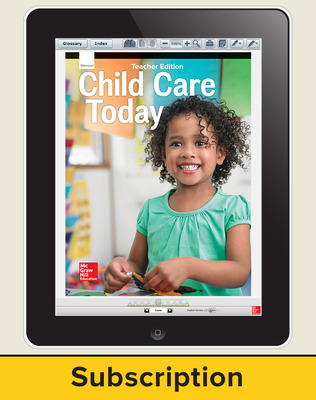 Glencoe Childcare Today © 2016 features online resources on the MHE ConnectED platform empowering teachers to easily teach, manage classroom assignments, and engage students. Teachers can access the student eBook, digital resources, assessment and planning tools in one convenient location. Print teacher editions are available print-on-demand on Create™.